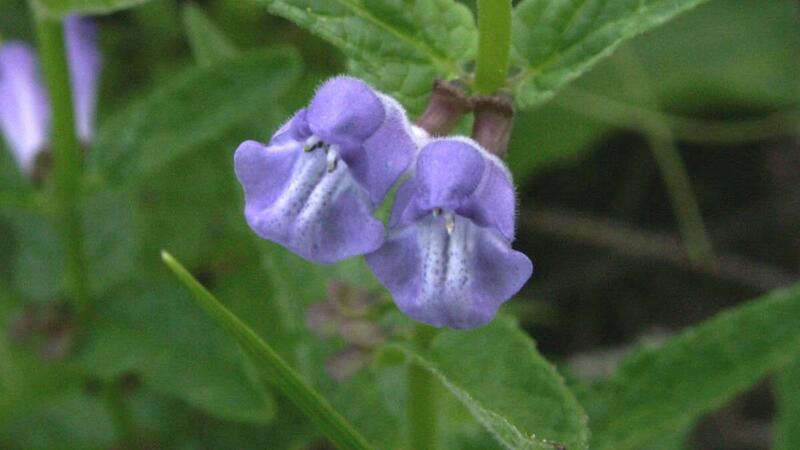 Skullcap is a perennial, blue-flowered herb, which thrives in marshes and alongside rivers and lakes. The specific epithet galericulata comes from the Latin word for hooded, in reference to the hooded shape of the flowers. The genus Scutellaria is found throughout the world, and the most recent taxonomic study of it was published in Kew Bulletin in 1990 by Kew botanist Alan Paton. The genus is of particular importance for its medicinal uses. Skullcap is a common waterside plant found throughout the United Kingdom and the Northern Hemisphere. Scutellaria galericulata is widespread in the temperate Northern Hemisphere. 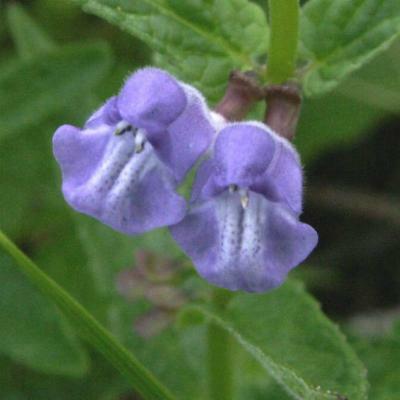 Skullcap is a non-aromatic herb, 0.1-0.7 m tall. Its leaves are borne opposite each other on the stem, and are 10-50 mm long, 3-20 mm wide. The leaves have a weakly toothed margin, and an acute apex (pointed tip). The inflorescence is terminal, with single flowers in the axils of leaf-like bracts. The calyx has two entire lips; an upper lip with a sail-like scutellum, which acts as a lever to remove the upper lip when the nutlets (dry, one-seeded fruits) are mature; a shovel-like lower lip, which catapults the nutlets free once the upper lip is removed. The corolla is blue to bluish-purple and 10-18 mm long. Each flower has four stamens (male parts). The nutlets are brown, tuberculate (covered with wart-like outgrowths), and float on water during dispersal. Scutellaria galericulata is not considered to be threatened. Germination testing: 85% germination achieved with: germination medium = 1% agar with 250 mg/l gibberellic acid (GA3); germination conditions = 21ºC, 12/12. At Kew, skullcap is grown outdoors in a raised bed filled with sandy soil. It thrives in full sun and does not need any extra feed or mulch. It has survived snow and severe frost with no protection. It has suffered from infestations of parasitic dodder ( Cuscuta europaea ). Attempts to take parasite-free cuttings have failed, and so Kew staff plan to grow skullcap from seed to ensure they obtain dodder-free plants. Skullcap can be seen growing in the Plant Family Beds at Kew, along with other members of the Lamiaceae (mint) family. The skullcap growing here is visited each year by a bright yellow sawfly. It is thought that the sawfly may utilise the chemicals in the leaf material for its own defence mechanisms. 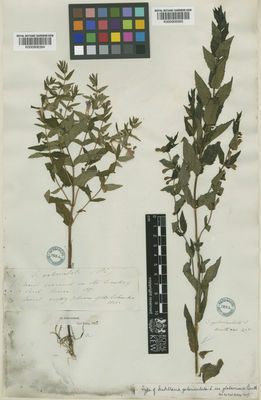 A dried specimen of the related species Scutellaria paucifolia was found in a notebook belonging to the Scottish explorer David Livingstone, and the specimen details can be seen online in the Herbarium Catalogue. This specimen was collected in 1861 on Livingstone's Zambesi Expedition. Chemotaxonomic studies of members of the Lamiaceae (mint family) have helped in the isolation of a range of terpenoids that may be developed as environmentally-friendly pest control agents. For example, there are terpenoids in bugle ( Ajuga reptans ) and skullcap ( Scutellaria galericulata ) that inhibit feeding in economically important insects, such as the African army worm and desert locust. Some promising compounds are very complex, and difficult to synthesise, so scientists look for simpler, related compounds with similar activity. The neem tree ( Azadirachta indica ), contains the complex compound azadirachtin which has anti-insect activity. Kew scientists, along with those from Birkbeck College and Cambridge University, have characterised functional groups (parts) of this molecule thought to be responsible for its potent anti-feedant and growth disruption activity. Plants with simpler compounds having the same active groups are being sought. Several species of Scutellaria are used medicinally, and as there are around 350 species, care must be taken to use the correct ones. Has been used in traditional medicine (mainly as a substitute for Scutellaria lateriflora); potential use in the development of environmentally-friendly pest control agents. Can be grown as an ornamental. Scutellaria galericulata f. albiflora Millsp. Scutellaria galericulata var. glaberrima Benth. Scutellaria galericulata var. vulgaris Benth. Rodriguez, B., de la Torre, M.C., Rodiguez, B., Bruno, M., Piozzi, F., Savona, G., Simmonds, M.S.J., Blaney, W.M. Perales, A. (1993). Neo-clerodane insect antifeedants from Scutellaria galericulata. Phytochemistry 33: 309-315. Cole, M.D., Anderson, J.C., Blaney, W.M., Fellow, L.E., Ley, S.V., Sheppard, R.N. & Simmonds, M.S.J. (1990). Neo-clerodane insect antifeedants from Scutellaria galericulata. Phytochemistry 29: 1793-1796. Paton, A. (1990). A global taxonomic investigation of Scutellaria (Labiatae). Kew Bull. 45: 399-450.